Do you feel short, sharp pain in your teeth when you take cold foods like ice creams or hot drinks like tea or coffee? This could be a sign of sensitive teeth. Having sensitive teeth is very painful. The reason for sensitive teeth can be due to dentine (inner layer of the teeth) exposure. Enamel covers dentin, which is the outer layer of the teeth. When the layer of the enamel becomes thin especially at the gum-line, the dentin is not protected. The dentin has small channels which are linked to the nerve of the tooth. So when there is exposure of dentin, tooth nerves get stimulated thereby causing pain in teeth. Vigorous brushing: Brushing teeth too hard or brushing with toothbrush that has hard bristles can lead to loss of enamel which causes exposure of dentin. Gum disease: Early stage of gum diseases which is called as gingivitis can also be the cause for sensitive teeth. When gingivitis is not treated at an early stage it can lead to loss of gum tissues. Receding gums: Receding gums are caused when the gum disease is not treated early. This leads to the advanced stage called periodontitis. 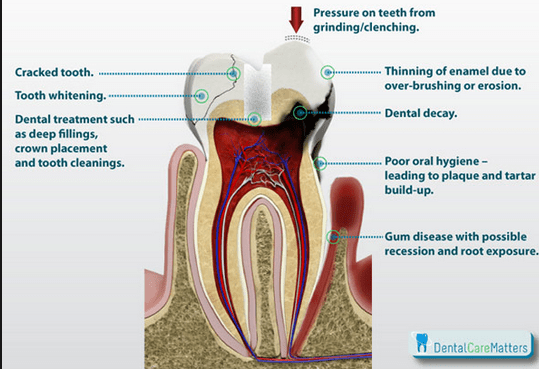 Teeth grinding: Teeth grinding can lead to loss of enamel by which dentin is exposed thus causing pain. Cracked teeth: If any of your teeth is cracked or broken, bacteria can easily enter inside the teeth, thus causing inflammation and tenderness of gums. This can lead to sensitivity of teeth. Plaque build up: If you don’t brush and floss your teeth regularly, there will be build up of plaque. Plaque damages the enamel of teeth, making them prone to sensitivity. Using teeth whitening products: In some toothpastes, many manufacturers add teeth whitening chemicals. Some people are sensitive to these chemicals which make their teeth sensitive. Taking foods that are acidic: If you are regularly consuming food that has high amount of acid content it can cause erosion of enamel. Foods such as tomatoes, pickles, citrus fruits, etc., are acidic. If you recently had a dental treatment: Sensitivity in teeth may occur if you recently had a dental treatment like scaling (cleaning of teeth), root canal treatment, restoration of tooth or teeth (dental crown or bridge), etc. How to reduce sensitivity of teeth? Maintaining good oral hygiene: Good oral hygiene means proper cleaning of teeth and mouth. This includes brushing and flossing regularly. It is advisable to brush and floss at least twice a day. It is a good practice to brush and floss after each meal. As you keep your teeth clean, there are less chances of plaque build up and helps you to prevent sensitivity. Using a toothbrush that has soft bristles: Toothbrush that has soft bristles helps in reducing sensitivity of teeth. Using anti-sensitive toothpaste: There are many toothpastes available for sensitive teeth. By regularly using these toothpastes it tends to reduce sensitivity in teeth. Keep a check on your diet: If you are frequently consuming lot of acidic food, it will lead to dissolving of teeth enamel, thus exposing the dentin which can cause your teeth to become sensitive. Visiting the dentist every six months: Get your teeth cleaned by a dentist. Your dentist will give suggestions in maintaining oral health by which there will be less chances of teeth becoming sensitive. This entry was posted on Friday, October 18th, 2013 at 6:17 am	and is filed under Dental Health. You can follow any responses to this entry through the RSS 2.0 feed. You can skip to the end and leave a response. Pinging is currently not allowed.